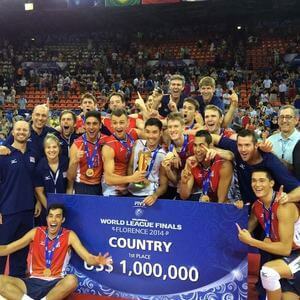 The Rio 2016 Olympics are still far off but we are very excited about what this quadrennial holds for the Men’s and Women’s teams at USA Volleyball. The GMS community could not ask for a better representation on the international level with 3 staff members now working in Anaheim. John Speraw will continue coaching the UCLA men in addition to leading the USA men. Tom Black will serve as an assistant coach with the USA women while maintaining his role as head coach at Loyola Marymount University. Mike Wall has joined the USA men’s staff as an assistant coach, while continuing his involvement with Gold Medal Squared. We are thrilled to have national team volleyball coaches who are studying the game with scientific diligence and leading with a growth mindset. We anticipate learning a lot from their journey leading up to the summer games in Rio de Janeiro, Brazil. Spend some time listening to Karch Kiraly and it quickly becomes apparent that his coaching process has a strong teaching emphasis. Over the past few years I have come in contact with Karch a few times, most recently at Penn State University after he commentated for one of our ESPN matches. Soon after being introduced and learning that I was on staff at PSU (serving as the Volunteer Assistant Coach) he immediately asked me what the most significant thing I had learned since joining the program. I was caught off guard, not by the question, but by his very intense interest in what my answer might entail. It didn’t feel like small talk, because it wasn’t. The encyclopedia of volleyball experience that Karch talks about in his Reading the Game presentation seems to have seamlessly carried over to his coaching mindset. There is also Luka Slabe, slovenian national mens coach.